In the mathematical field of complex analysis, a meromorphic function on an open subset D of the complex plane is a function that is holomorphic on all of D except for a discrete set of isolated points, which are poles of the function. This terminology comes from the Ancient Greek meros (μέρος), meaning "part," as opposed to holos (ὅλος), meaning "whole." Every meromorphic function on D can be expressed as the ratio between two holomorphic functions (with the denominator not constant 0) defined on D: any pole must coincide with a zero of the denominator. The gamma function is meromorphic in the whole complex plane. Intuitively, a meromorphic function is a ratio of two well-behaved (holomorphic) functions. Such a function will still be well-behaved, except possibly at the points where the denominator of the fraction is zero. If the denominator has a zero at z and the numerator does not, then the value of the function will approach infinity; if both parts have a zero at z, then one must compare the multiplicities of these zeros. From an algebraic point of view, if D is connected, then the set of meromorphic functions is the field of fractions of the integral domain of the set of holomorphic functions. This is analogous to the relationship between the rational numbers and the integers. In the 1930s, in group theory, a meromorphic function (or meromorph) was a function from a group G into itself that preserved the product on the group. The image of this function was called an automorphism of G. Similarly, a homomorphic function (or homomorph) was a function between groups that preserved the product, while a homomorphism was the image of a homomorph. This terminology is now obsolete. The term endomorphism is now used for the function itself, with no special name given to the image of the function. The term meromorph is no longer used in group theory. on a connected component of D. Thus, if D is connected, the meromorphic functions form a field, in fact a field extension of the complex numbers. Unlike in dimension one, in higher dimensions there do exist complex manifolds on which there are no non-constant meromorphic functions, for example, most complex tori. are meromorphic on the whole complex plane. as well as the gamma function and the Riemann zeta function are meromorphic on the whole complex plane. is not meromorphic on the whole complex plane, as it cannot be defined on the whole complex plane while only excluding a set of isolated points. is not meromorphic either, as it has an essential singularity at 0. On a Riemann surface, every point admits an open neighborhood which is biholomorphic to an open subset of the complex plane. Thereby the notion of a meromorphic function can be defined for every Riemann surface. For every Riemann surface, a meromorphic function is the same as a holomorphic function that maps to the Riemann sphere and which is not constant ∞. 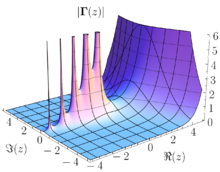 The poles correspond to those complex numbers which are mapped to ∞. On a non-compact Riemann surface, every meromorphic function can be realized as a quotient of two (globally defined) holomorphic functions. In contrast, on a compact Riemann surface, every holomorphic function is constant, while there always exist non-constant meromorphic functions. Meromorphic functions on an elliptic curve are also known as elliptic functions.